Do you think you know Narnia inside and out? What do Dufflepuds use as boats? What is Lucy's last name? What does Puzzle fish out of Cauldron Pool? 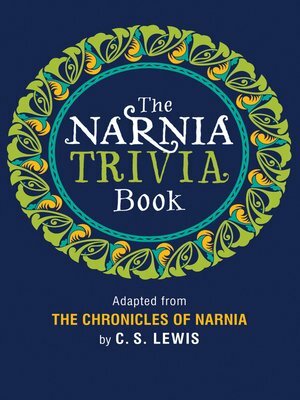 Find the answers to these questions and more in The Narnia Trivia Book. C. S. Lewis's classic series is filled with extraordinary characters, fantastic creatures, and thrilling journeys. Epic battles between good and evil, heroic deeds, and friendships won and lost all come together in this magical realm where details are important and worlds come and go on the toss of a ring. Brush up on your Narnia know-how by reading the entire Chronicles of Narnia: The Magician's Nephew; The Lion, the Witch and the Wardrobe; The Horse and His Boy; Prince Caspian; The Voyage of the Dawn Treader; The Silver Chair; and The Last Battle.